Contact the owner Rick @ 303-726-2934 or blaher(at)knology(dot)net.WHY BUY NEW – SAVE THE DEPRECIATION. 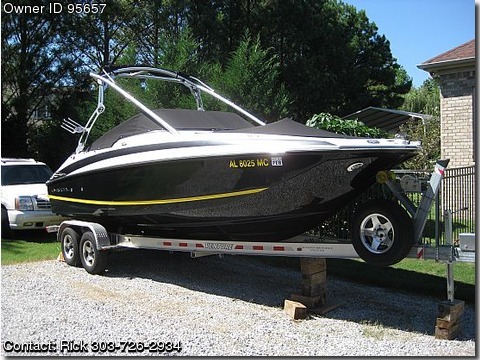 Mint 2010 25’ Regal 2520 bow rider deck boat with 2011 custom aluminum trailer (5 brand new radial tires and alloy wheels), 5.7L 300 hp Volvo Penta (just over 120 hours total), twin stainless props, 2 batteries and switch (Off, 1, 2, both), gas fume detector, Fireboy auto extinguisher in engine compartment. Capable of 50+ mph, rated for 14 people, Wakeboard tower with two swivel racks, swim platform and extended teak swim deck, teak cockpit table, underwater stern lights, docking lights, spare radial tire, custom aluminum rims, bow and cockpit covers, Bimini top, digital depth finder, Hummingbird fish finder with GPS, 2nd built-in GPS, Removable carpets, 9-speaker (3 audio zones + subwoofer) Fusion AM/FM/CD/SAT radio with 2 500-watt amplifiers & IPOD/MP3 adapters, transom stereo remote, transom tilt control, refreshment center (counter & sink), head (not a porta-potti), 10 gal fresh water tank, bow and stern showers and ladders, automatic/manual bilge pump, trash can and ice chest storage. Includes rubber-coated anchor, ropes, 14+ life and ski jackets, 1 wake board, 1 kneeboard, inflatable 2-person tube with pump, and 7 dock bumpers. Extremely well designed & built, very stable in rough water. $49,900. Will include 2005 mint Cadillac Escalade ESV to pull it with for firm package price of $62,000. Car not for sale separately.